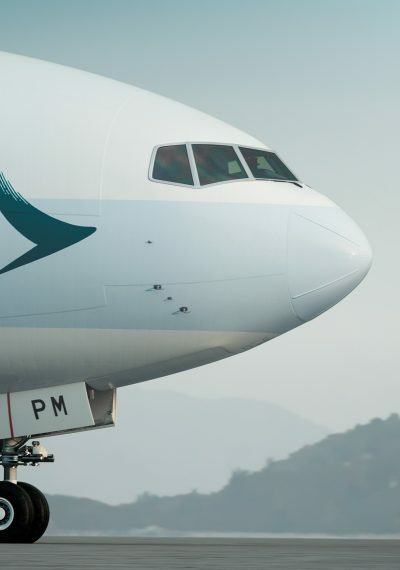 Checking in online 48 hours before the flight is a breeze thanks to the Cathay app. 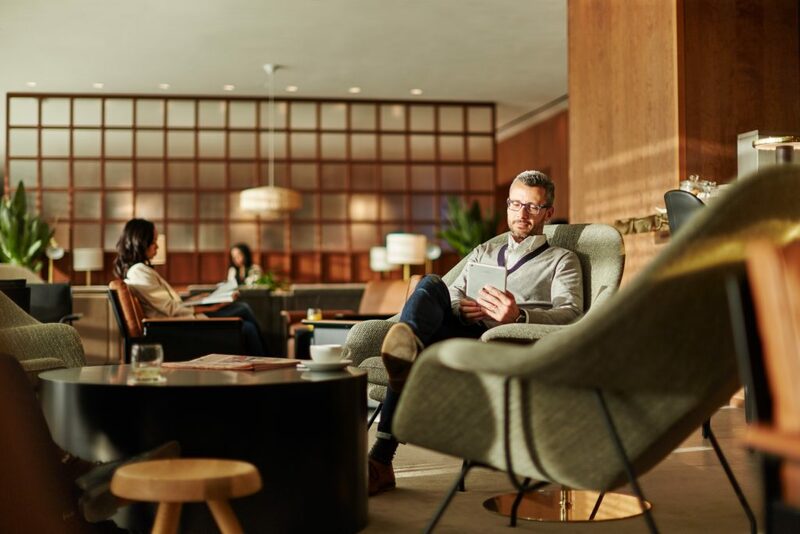 Once you arrive at the airport you’re swiftly whisked through fast track security, giving you more time to shop and enjoy the lounge. As a business class passenger you get 40kgs of luggage, more so if you have status with OneWorld. Once through security it’s off to the lounge. In London the newly opened T3 lounge is quite wonderful and epitomises class. Dark wood and natural light work in harmony alongside floor to ceiling window views of the planes going about their business below you. A decent buffet is accompanied by a made-to-order noodle bar that puts your tastebuds in Asia long before your flight lands. Back in Hong Kong you’ll find 4 different lounges, so no matter what gate you’re going from you’re never a massive walk from somewhere to sit, relax and fill your stomach. The Wing has won plenty of awards and it’s easy to see why. On the lower level you’ll find twenty four luxury hotel-esqe shower rooms and a load of computers but upstairs is where it all happens. Spread along the length of the terminal like a large balcony, there’s no ceiling so you end up with an outside indoors feeling and great views of the planes taking off and landing. The asian influence design complete with growing bamboo, clear lines and a mix of black and white marble and granite makes for a relaxing and zen environment. Upon entering the upper level there is a small buffet, a well stocked fridge of soft drinks and beer, tea and coffee and wine as well as plenty of soft seating including Cathy’s exclusively designed Solus chair which is private, functional and perfect for the solo traveller. If you venture through this well laid out space, past the washrooms and the black granite walls you’ll find a tasty noodle bar where cooked to order dim sum and noodles are available and an open bar come bakery with sweet treats, ice cream, a fantastic cocktail list, signature creme brûlée cappuccino and plenty of seating. Before I knew it it was time to board, once again as a Business or First passenger you avoid the lines and even get your own private air bridge to the plane. Already on my seat was a soft cloud like pillow, a toasty blanket, a bottle of Evian and some noise cancelling headphones. The crew quickly said hello to me (all using my name which they remembered throughout the fight) and offered champagne (Billecart-Salmon Brut), the booze free Oriental Breeze cocktail or water. I went for the Oriental Breeze a delicious mix of cranberry, sour-plum tea, honey, fresh lemon and a subtle hint of rose water which came with a tiny floating flower on the top of it. How delightful! About half an hour into the flight lunch was offered, starting with some nicely warmed smoked nuts and a huge drink option such as signature cocktails designed by some of Hong Kong’s best mixologists and local classics such as milk tea, all delivered from a nice open cart rather than a traditional huge grey trolley. It’s the thought out attention to detail like these which make this feel like a truly classy and topnotch business class product. It really feels like you’re being cared for and looked after on board. being looked after and cared for. Instead of going for the wine I gave a Betsy Beer a try. A World-First exclusive limited time beer brewed in Hong Kong for Cathay Pacific and designed to be enjoyed at 35,000 feet. You might think it’s a gimmick but actually it totally hits the spot, it activated my tastebuds in an environment which normally keeps them quiet. Crisp and cool the artisan beer comes in a well designed branded glass beer bottle, and has sweet notes of honey too it. It’s great for an airline such as Cathy to keep pushing back the boundaries and try new things like this, I can’t wait to see what they come up with next. It’s clear care has not only gone into the menu but also the service and plating of the dishes. Each main course is displayed on the cart allowing you to smell and see each option before deciding what to go for. The Thai Chu Chee Ling Fish Curry won out for me and packed a flavour punch with the spicy curry sauce. The cheese and fruit trolley came after that and then I found I still had room for the chocolate salted caramel tart dessert and chocolates alongside a cappuccino. Despite all the food I got peckish about halfway through the flight so ordered the afternoon tea. A few cakes and sandwiches were paired with warm scones, clotted cream and jam, hitting the sport wonderfully. About two hours before landing dinner came around but I was still too full so just snacked on a few pieces of hot garlic bread, and made a mental note to apologise to the passport control for my breathe after we landed. It’s so important on long-haul flights to get the meal service right, it is the thing I most look forward to when flying and Cathay have really nailed this, with large selections, strong flavours and beautiful presentation. 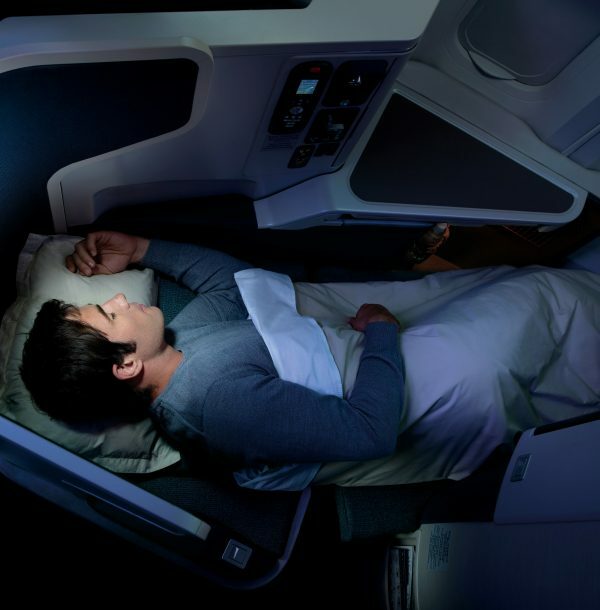 I managed to have a few hours of sleep, reclining my seat to a fully flat bed. 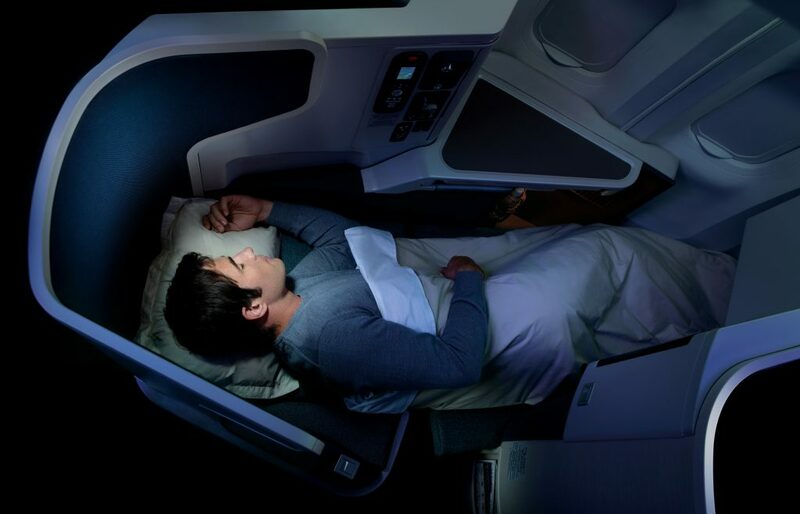 The cushioning and padding is all in the right place and the seat is wider than expected leaving plenty of room for a variety of sleep positions. The seats are in 1-2-1 reverse herringbone layout and are larger than they look, super comfy with classy green and ivory colour motif. My window seat gave me access to three windows along a large TV screen and a huge amount of storage including a small cupboard with vanity mirror, under-seat shoe store and large cubby hole to the left of the chair with an equally large window ledge / table above it, which also holds the dining table. The large ottoman at the end of your pod allows you to stretch out when operating the seat through the intuitive buttons on the side panel, which also contains a light, the remote for the entertainment (if you don’t want to use the touch screen) and a multi-national plug point and USB power. 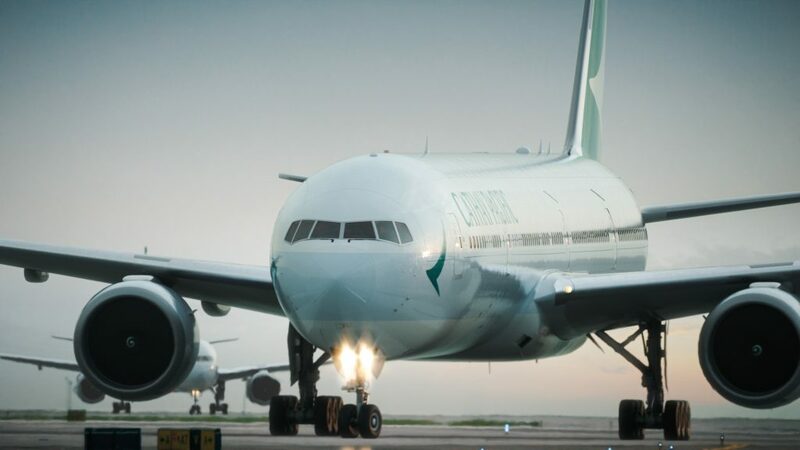 Cathay have a #lifewelltravelled ethos which shines through with attention to detail in things like artwork on the cabin bulkheads, fresh flowers in the bathrooms and in between the middle seats, and the toilet roll always being folded into a V overtime I visited the bathroom. The beautifully designed private pods are a cocoon of privacy and little touches such as the side wing help make you feel like you’re the only person on board. The StudioCX touchscreen in front of me had over 100 films and 500 TV shows including the latest Oscar winners such as La La Land and Manchester By The Sea. You can also do a box set binge on all the Harry Potter movies (including Fantastic Beasts) or full series of things like Atlanta and Westworld. The service from the crew stands was faultless, polite, personal and caring. It felt like they genuinely wanted to make my flight as enjoyable as possible and constantly glanced around the cabin to make sure everyone’s needs were taken care of. I was always addressed by name and the crew took a keen interest in how I was enjoying the flight, the food and the Betsy Beer, in fact they were proud to be serving it. This really is a world class Business product with a fantastic cabin, great food and some of the best staff in the sky. Classy and assured with personal touches which make the service all the more special. With hard products in business class much of a muchness sometimes it’s the smaller things and attention to details which matter and can make flying a pleasure again. 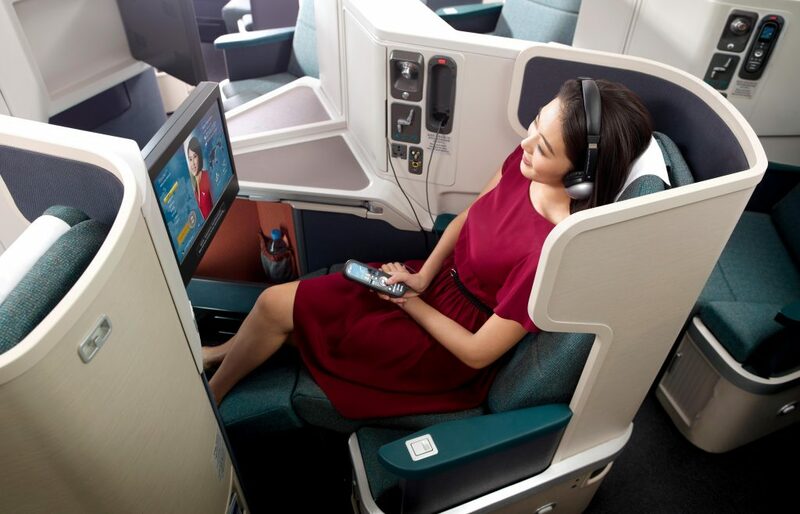 With Cathay Pacific’s business class product flying truly becomes a pleasure. 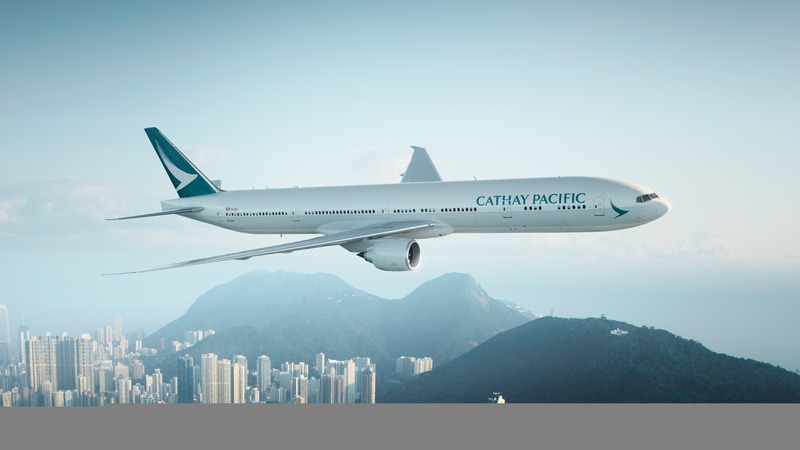 Return flights with Cathay Pacific from London to Hong Kong start from £3621.27 in Business Class. 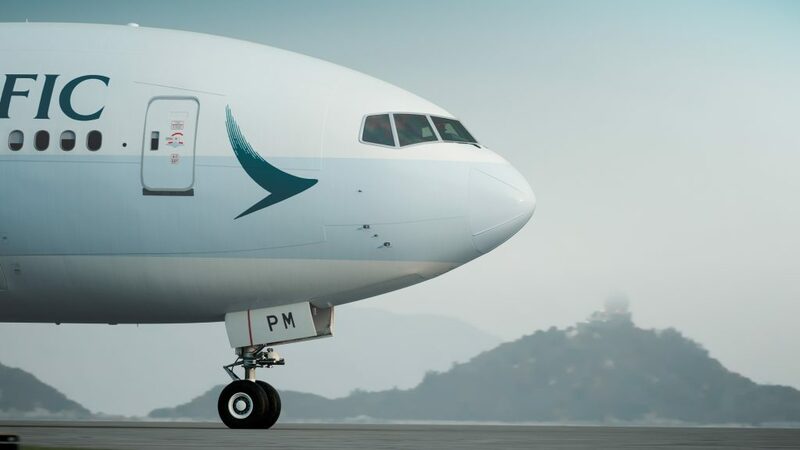 Cathay Pacific offers a choice of three routes between the UK and Hong Kong, and onwards to over 190 destinations globally. These include five flights daily from London Heathrow, and four flights per week from both Manchester Airport and Gatwick Airport. 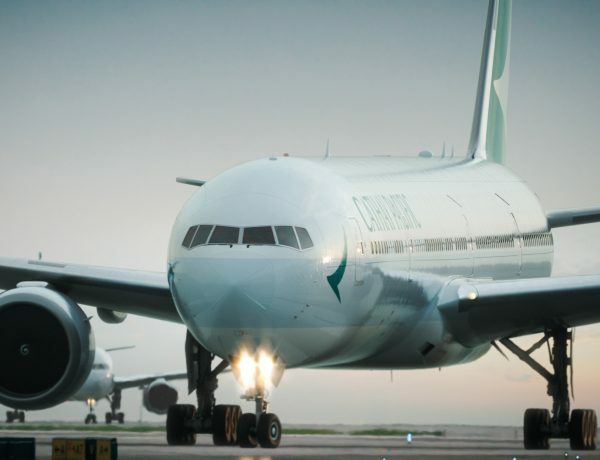 From June 2017, the Gatwick route will become a daily operation, while flights between Manchester and Hong Kong will increase to five per week. Currently, the Gatwick route exclusively features the new A350, however this will be joined by the Manchester route in June 2017. 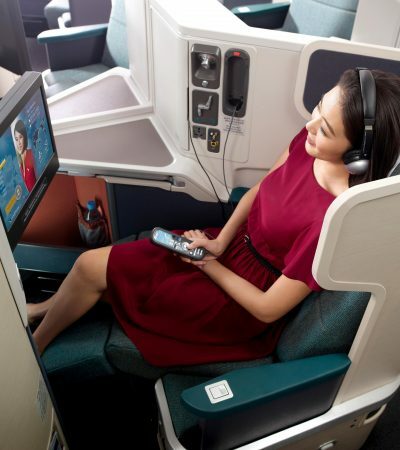 For further information, visit www.cathaypacific.co.uk or call 0800 917 8260.